Upon moving to Olympia, WA, in 2003 and starting up the radio program Cross Cultural Poetics, my first impression was that Seattle was a suburb of Cairo. That was because two of the first people I met in the area were Maged Zaher and Mohammed Metwalli, both émigré poets from Egypt's capital. They immediately made me feel part of a larger conversation about poetry that was happening amongst themselves and many other of Egypt's writers the next block over, in Egypt. How to resist the death grip and the officialdom of the Mubarak regime without opening the door to fundamentalist attitudes towards the poetic word that might suppress it? To what extent might the prose poem, and a flattening of the lyric, help to undermine a certain hyperbole perceived as problematic for the Arabic language? What is the most productive way to lay out a lineage of modern Egyptian poetry? Maged Zaher has been a guest on CCP at least four times discussing these questions as well as his own poetry (#1,#30, #91, #195), so I thought to start this column that Jessica Lowenthal, Al Filreis, and Mike Hennessy were kind enough to ask me to write as a commentary on CCP by calling attention to his voice and writing. Indeed, the very first episode of CCP focused on the situation of publication and censorship in Egypt and China. Subsequent appearances for Zaher concerned themselves with translations of fellow Egyptian poets, Zaher's own poems as they would later appear in his book Portrait of the Poet as an Engineer, and he and Pam Brown's collaboratively written book far-out library software. Whose escape plan is this? How did they figure out that we are easy to hustle? What if we die strangers? Surrealist interviewing skills, just average management please. Zaher’s field of reference, from Marx to Celan to the Human Resources department of a large corporation to the random public American fear of the Arab, work a proscribed vernacular from its inside. Zaher can’t hide out in a poetic language that will grant him autonomy from any of the threats, be they corporate or the racial. His poetry is not hermetic. Neither does his language capitulate to the middlebrow or to commodification. If “self critical doesn’t always work” one can usually be diplomatic, where to be diplomatic is a subtle resistance to partisanship or a sense of the natural and fitting. Personal identity needs to be destroyed but one can always be charming. It is true that CCP emerged at the height of our outrage over the wars in Iraq and Afghanistan, and that I've considered it crucial to make available the voices and language of poets in Arabic. For the program I've dialed up and spoken with writers from Syria, Tunisia, Egypt, Libya, Gaza, Israel and Iraq in recent years. If CCP might provide a resource for people in places where Arabic is spoken, and for those of us interested in what they are saying, then poetry really can be news that stays news. Though the communications technology makes much possible I also think poetry works best if rooted in a conversation in three dimensional space. These days it no longer feels to me like Seattle is a suburb of Cairo, which makes me sad, especially given all that is going on there. But I always enjoy talking with Maged Zaher. Meanwhile, it seems I’ve never done a show specifically on Zaher’s Portrait of The Poet as an Engineer. 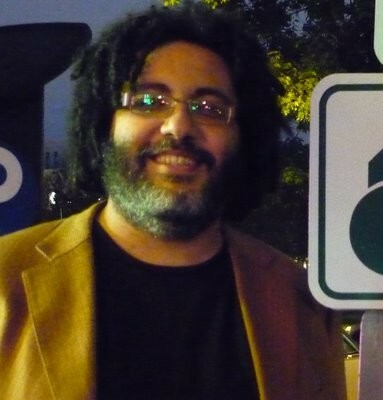 Maged Zaher, as a Coptic Christian living in Seattle but going back and forth to Egypt, has an intriguingly refracted positionality on recent events and his own poetry. Can I ask CCP listeners to look for a new Zaher appearance on the program, reading from Portrait and discussing Egypt, in the very near future? I, Karl Marx, remember that my comrades - whom we shared together the cigarettes, the Whiskey and the class struggle - had left me to my thoughts. I turned to God: Father, father, why have you left me? The Roman counselor refused to offer me the plea-bargain and drank my blood with the central committee. I told him, you shall see me again, I shall resurrect in the WTO protest, I will be an angry woman with pink hair, and when the city turns republican, I shall offer my body and blood to the last tear gas bomb holder. He shall kiss me on the lips and they will crucify me again. I, Karl Marx, was not with the Russian troops in Prague. These were not my pictures on the tanks. I was not the grand inquisitor of Spain. I did not order the burn of the Jews, the Heretics, to protect the true belief in Proletarian values. I, Karl Marx, am a descendant of the Pharos, but in case any of my grandmothers fucked a Greek, an Arab, a Persian, or a Turk, I might not be able to guarantee my ethnic purity.